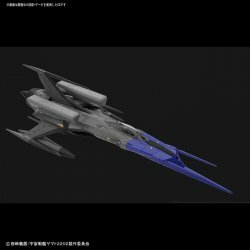 A new type of space battle fighter aircraft black bird equipped with a wave experiment ship "Ginga" is kitized with 1/72! Blue Kato machine of the nose and black drone can be reproduced selectively. The windshield uses clear part.. The windshield uses clear parts and reproduces the internal cockpit. A new mold missile pod is additionally installed.